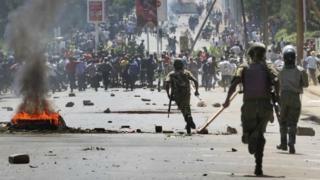 At least two people have died and five have been injured after Kenyan police opened fire to disperse opposition protests in the western city of Kisumu, a local reporter has told the BBC. The police have not commented. The opposition has been holding weekly demonstrations against the electoral commission, which it says is biased. Nairobi's police chief had warned opposition supporters not to take part in Monday's protest in the Kenyan capital "if you value your life". Officers shot dead three people in similar protests in May. They said they were acting in self-defence. Journalist Richard Omondi says he has confirmed the latest fatalities with the authorities at the Kisumu hospital where the injured were taken. A bullet has also been removed from the body of a five-year-old boy, who survived the injury. Omondi told the BBC that protesters had earlier blocked roads with burning tyres and were heading to the electoral commission's offices when police intervened. They used tear gas followed by live bullets to disperse the demonstrators. Presidential spokesman Manoah Esipisu said those shot had been looting supermarkets. The opposition protest in Nairobi passed off peacefully, the BBC's Anne Soy reported from the city. She said protesters passed the headquarters of the electoral commission but there was no attempt to enter the building, after marshals from the opposition formed a cordon around it. Last month, there were complaints of police brutality as officers were pictured assaulting demonstrators in Nairobi. On Sunday, Nairobi police chief Japheth Koome said police were prepared to use lethal force if necessary, after a Kenyan court had ruled the planned protests illegal. The ruling was overturned on Monday morning by judge Joseph Onguto, who said the opposition Cord alliance had the right to picket. Cord, led by former Prime Minister Raila Odinga, wants members of the electoral commission to resign ahead of next year's presidential election. It says the commission is biased in favour of the governing Jubilee coalition and wants it replaced by a neutral body.